August 29, 2011: Added some photos from Bubba's high school yearbook to the gallery. August 11, 2011: Happy Birthday, Bubba! June 3, 2011: Added a Yankees Magazine article about Bubba. July 23, 2009: Added this card to the card gallery. Also, posted Bubba's blog, since the original site is 404. May 11, 2009: Added this card to the card gallery. February 17, 2009: Added this photo to the gallery. 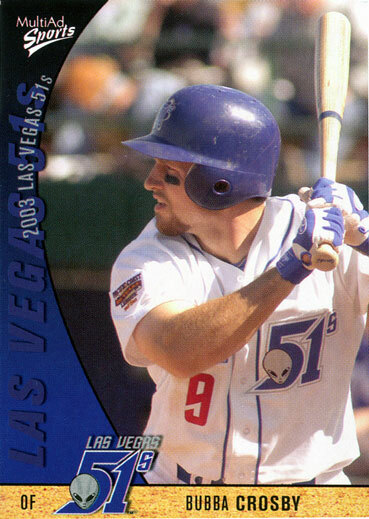 January 10, 2009: Added Bubba's 2003 Las Vegas 51s card to the Gallery. 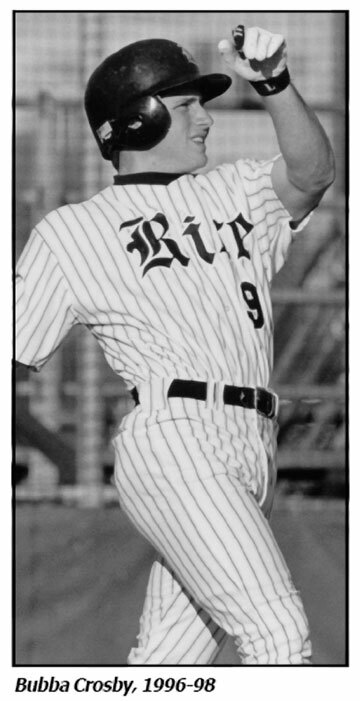 November 9, 2008: Added some text and photos from the 1998 Rice Media Guide. October 9, 2008: Added this card to the Gallery. August 11, 2008: Happy Birthday, Bubba! June 15, 2008: Yankees beat reporter Peter Abraham reports that Bubba has retired. May 13, 2008: Added this video, from 2006. March 29, 2008: It's the championship round of Red Hot Mama's "Who's hotter?" tournament: Bubba Crosby vs. Brandon Phillips. Vote early, vote often! March 8, 2008: It's official. The Seattle Times Mariners Blog confirms that Bubba has been released, and says it's because he failed his physical. March 7, 2008: Bubba has been released by Seattle. February 25, 2008: Changed the fan mail address on the contact page to the Rainiers' spring training address. February 24, 2008: Added some info on Mariners spring training. February 19, 2008: It's official. Bubba signed with the Mariners. January 14, 2008: Added a couple of photos from 2005 to the gallery. December 17, 2007: Added some photos from the 1994 Bellaire High School yearbook to the gallery. 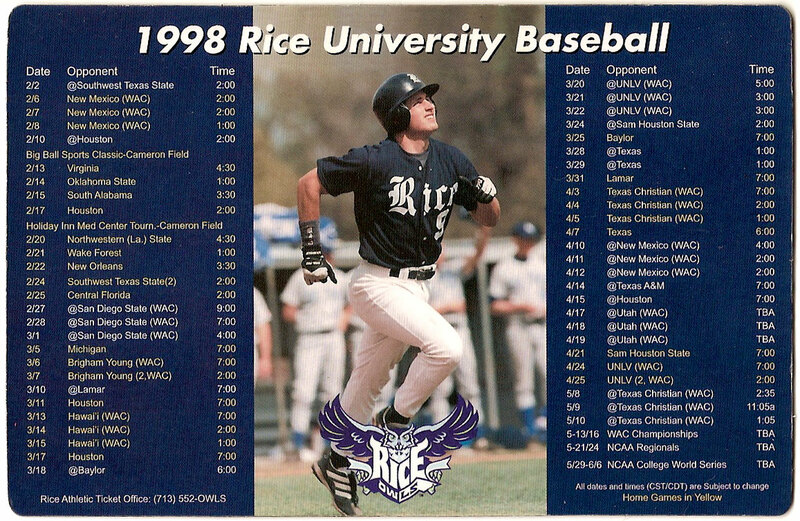 December 2, 2007: Added photos from this Rice media guide (PDF), here, here, and here. 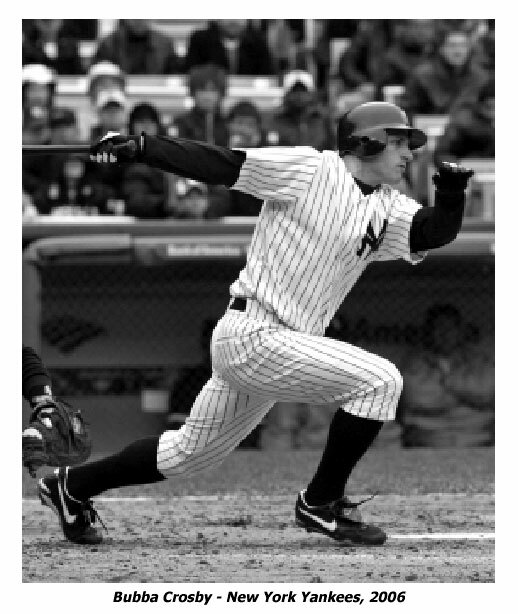 November 27, 2007: Added a countdown to spring training to the front page. November 24, 2007: Added another card to the baseball card gallery. October 17, 2007: Bubba is no longer with the Reds. Baseball America reports that Cincinnati granted him free agency. September 14, 2007: Added another card to the baseball card gallery. August 23, 2007: Added this photo to the gallery. August 15, 2007: Added a couple of photos to the gallery. 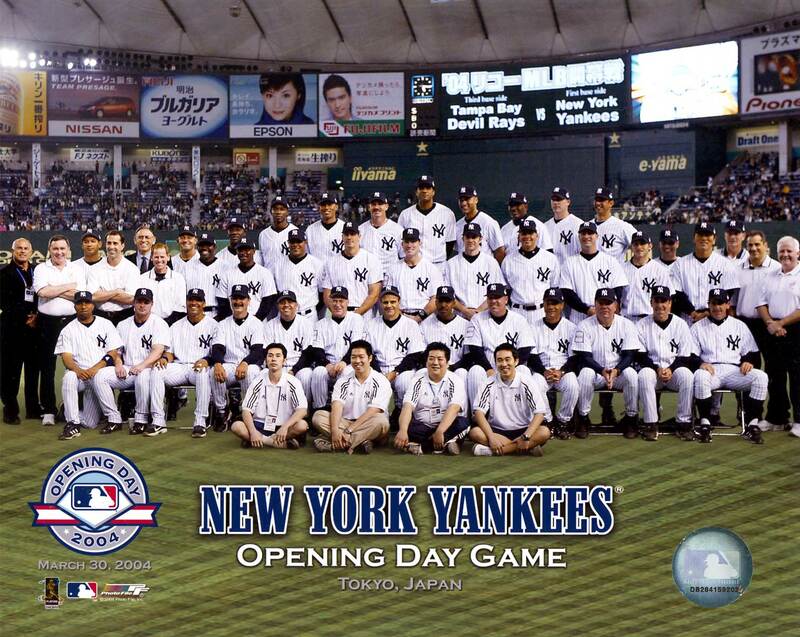 They're from 2004, when the Yankees were at Dodger Stadium. August 12, 2007: Added some 2005 portraits to the gallery. August 11, 2007: Happy Birthday, Bubba! July 31, 2007: Added this photo to the gallery. Also, Bubba is now back Sarasota, working with the training staff there to rehab his shoulder. July 26, 2007: Bubba's surgery went very well, and he's expected to return to Sarasota in the next day or two to continue rehabbing there. Bats trainer Chris Lapole says Bubba will be "100% ready to go" by spring training next year. July 25, 2007: Bubba had the surgery in Cincinnati, and is still there. He will eventually return to Sarasota to continue his recovery. July 18, 2007: The surgery is scheduled for Friday, July 20. July 17, 2007: Bubba will have surgery on his left shoulder later this week. He's out for the season. July 16, 2007: Still no update on how Bubba's doing. Bats trainer Chris Lapole didn't talk to the press today as expected. July 15, 2007: Bats radio announcer Jim Kelch will have a Bubba update tomorrow. 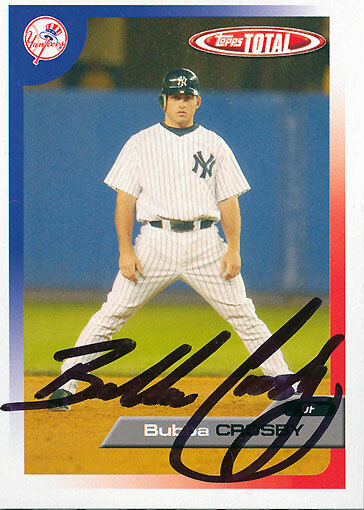 June 23, 2007: Added another card to the baseball card gallery. June 8, 2007: Bats trainer Chris Lapole says he expects Bubba back in the lineup at the end of July. June 7, 2007: Bubba's had a bit of a setback in Sarasota. It will be awhile before he's back in the lineup. June 3, 2007: Added more portraits of Bubba. 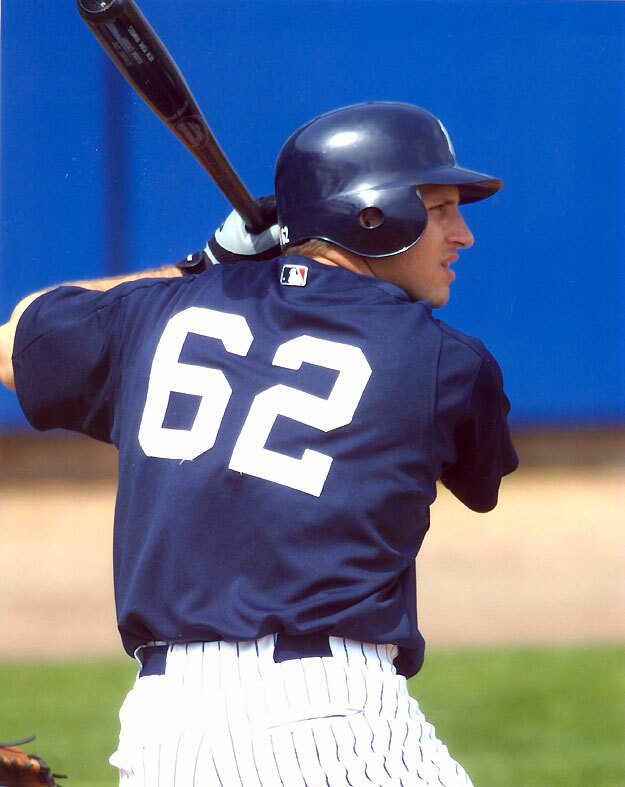 These were taken in Tampa, during Yankees spring training 2004 and 2006. June 1, 2007: Added some portraits of Bubba taken when he was a Dodger. 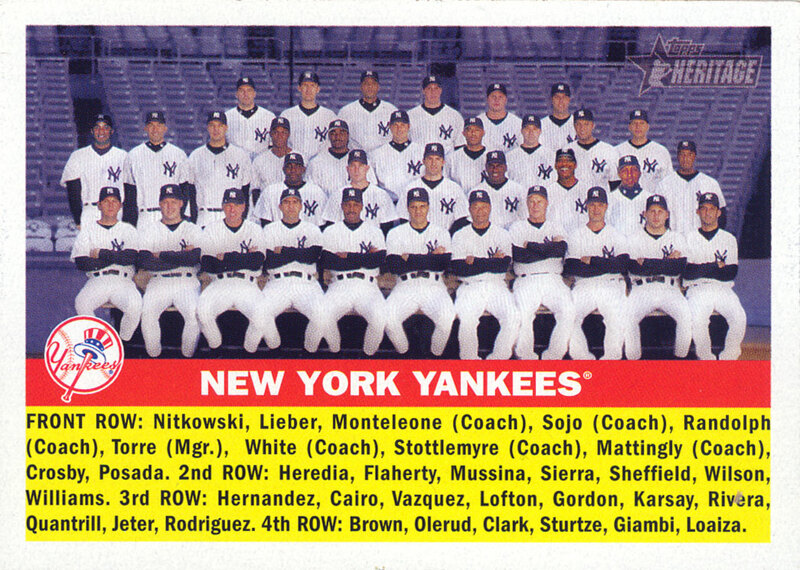 They were taken in Vero Beach, during spring training 1999. Which would have made him 22 years old. May 30, 2007: Bubba may play some games with the Sarasota Reds if the extended spring training games go well. May 29, 2007: Posted a link to this article. Also, Bubba has left the Bats to play some extended spring training games in Florida. May 22, 2007: Bubba's rehab is going well; the trainer is pleased with the progress Bubba is making. 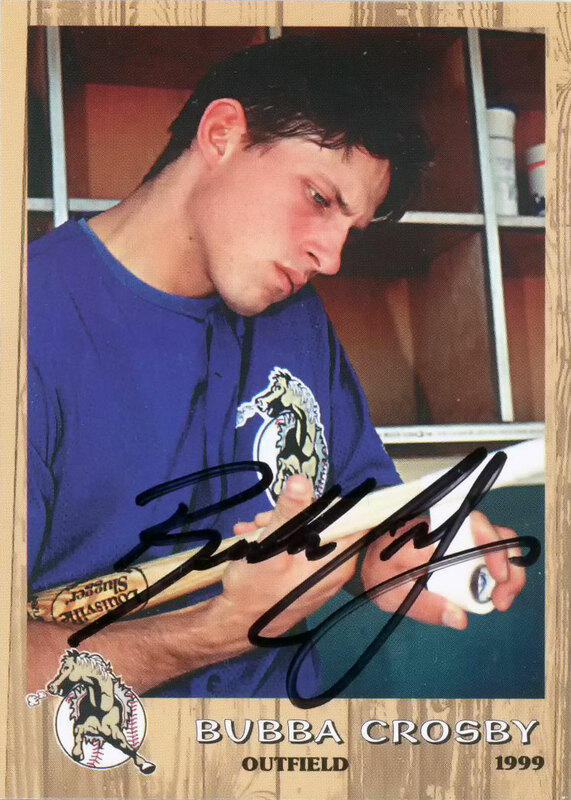 May 13, 2007: Added another card to the baseball card gallery. May 7, 2007: Bubba had an MRI today. Good news; he won't need surgery. May 6, 2007: Bubba is still on the DL, and is no longer traveling with the team. They've sent him to Cincinnati to be evaluated by the Reds medical staff. April 30, 2007: Bubba is still not ready to play, but he says he's getting close. April 24, 2007: Correction: The Bats put Bubba on the 7-day DL. It's retroactive to April 20. April 23, 2007: The Bats put Bubba on the 15-day DL today. April 20, 2007: The Louisville Bats are auctioning off game-worn autographed hats. Proceeds will be donated to a memorial fund for the Virginia Tech victims. April 10, 2007: Nice article with a photo of Bubba here. April 2, 2007: Added photos from the Enquirer slideshow to the portraits gallery. March 27, 2007: Bubba has accepted the minor league assignment. March 25, 2007: Added some photos to the portraits and game photos gallery. March 24, 2007: Bubba has been outrighted to the minors. 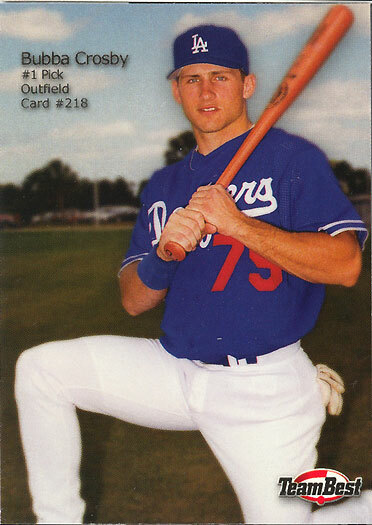 March 17, 2007: Added another card to the baseball card gallery. March 3, 2007: Added some new pics to the Portaits section of the gallery. March 1, 2007: Added this photo, from yesterday's intrasquad game. February 28, 2007: Added info about today's intrasquad game to the front page. 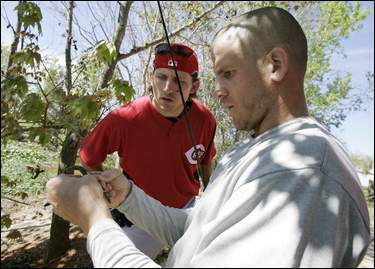 February 23, 2007: Added this photo, of Bubba fishing with Ryan Freel. February 20, 2007: Added this article, about Bubba boxing to keep in shape in the off-season. February 19, 2007: Added a link to the Cincinnati Enquirer Bubba Crosby profile to the front page. February 15, 2007: Added image files of Bubba's page from the Reds media guide: page 77, page 78, page 79. February 14, 2007: Added this article. 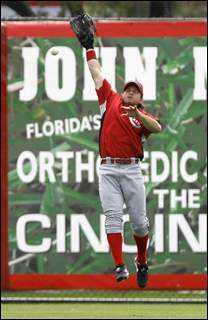 February 7, 2007: Added info about the 2007 Reds media guide to the front page. 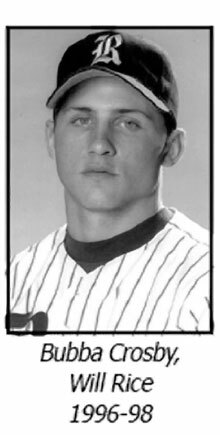 January 26, 2007: Added a new card to the baseball card gallery. January 13, 2007: Added info on Reds spring training tickets to the front page. January 8, 2007: Added Bubba's 2000 San Bernardino Stampede card to the Gallery. January 2, 2007: Updated the front page and added more info on Reds spring training tickets. January 1, 2007: Updated the Gamelog.